1. "Leslie Groves." Nuclear Files - From Nuclear Proliferation to Nuclear Testing, from Hiroshima to North Korea, Nuclear Files Offers the A to Z on Nuclear Issues. Nuclear Age Peace Foundation. Web. 28 May 2010. <http://www.nuclearfiles.org/menu/library/biographies/bio_groves-leslie.htm>. 2. "Leslie R. Groves." United States History. Web. 12 Apr. 2010. <http://www.u-s-history.com/pages/h1626.html>. 3. 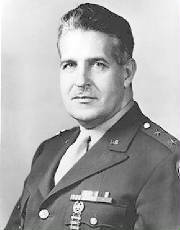 Norris, Robert S. "Leslie Richard Groves, Lieutenant General, United States Army." Arlington National Cemetery Website Title Page. 12 Nov. 2000. Web. 12 Apr. 2010. <http://www.arlingtoncemetery.net/lggroves.htm>. 4. Rossenfeld, Carrie. "General Leslie Groves (1896 - 1970)." Atomicarchive.com: Exploring the History, Science, and Consequences of the Atomic Bomb. AJ Software & Multimedia. Web. 12 Apr. 2010. <http://www.atomicarchive.com/Bios/Groves.shtml>.